Young's RV Center, located in Fremont, Ohio, wants you to experience the finer things with this 2019 Salem Hemisphere 282RK Travel Trailer! Manufactured by Forest River, this Salem Hemisphere is tastefully decorated with modern decor and cutting edge looks and will surely be envied by everyone. This Salem Hemisphere 282RK features a gorgeous front master bedroom with lots of storage options. It has a queen bed with overhead storage, full-size mirrored wardrobe, dresser, and dual bedside nightstands with mirrored closets above. The side aisle bath includes a full size radius shower, large linen closet, sink with medicine cabinet above and cabinet below, and toilet. 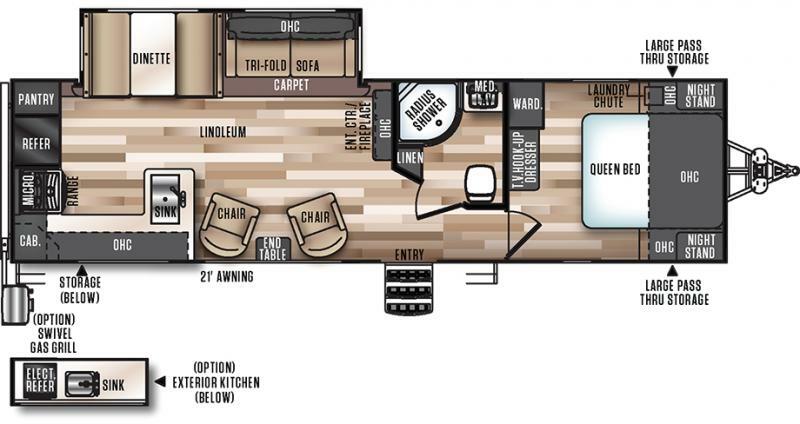 Moving to the center living area of this Salem Hemisphere, you will be greeted by a large super slide holding the free standing table & chairs and the tri-fold sleeper sofa. This slide-out allows for more space to relax or entertain in a comfortable atmosphere. There are also 2 recliner chairs with an end table between for extra seating. And you can even "fire-up" the fireplace on those damp, cool nights. And finally, at the rear of this Salem Hemisphere 282RK is the intuitively designed residential style kitchen. This L-shaped kitchen offers plenty of counter space and storage cabinets and drawers. It includes a large stainless steel, single bowl kitchen sink, 10.7 CU FT residential refrigerator, microwave, 3-burner range, and a large pantry for all of your "goodies". Cooking is a simple affair in this fully equipped kitchen. But that's not all... this Hemisphere also has an outside kitchen for your enjoyment. Less of a mess and more fun in the sun for the family chef. So not only is this Salem 282RK beautiful and spacious, but it also offers all of the convenient features a vacationing family would want. With so much to see, you don't want to miss checking out this Travel Trailer!